Today, April 11, 2019, many States in the USA are celebrating National Alcohol Screening Day. NASD is held annually on Thursday of the first full week of April offering anonymous and confidential screenings online or in-person at NASD events. 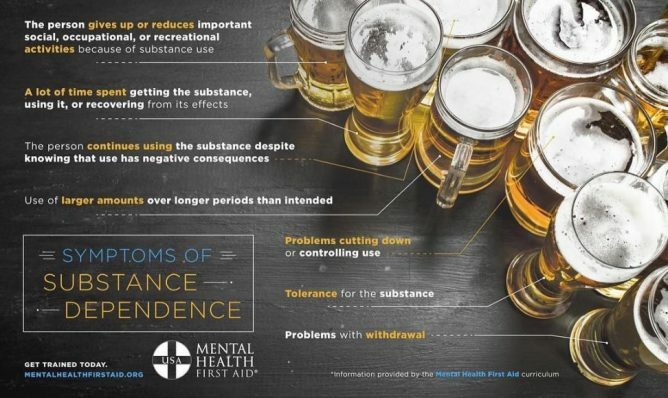 It is an outreach, education, and screening initiative that raises awareness about harmful and dependent drinking behaviours and connects individuals who are at risk with treatment options. Every year, the day raises awareness about the harmful effects alcohol abuse and alcohol dependency can have on a person. And highlights the critical needs of those with alcohol/substance use disorders and their families. Symptoms of Substance Dependence. Source: Mental Health First Aid. The report ‘Alcohol in Ireland: consumption, harm, cost and policy response’ by the Health Research Board published in 2016 found that alcohol consumption in Ireland was around 11.15 litres of pure alcohol per person per year; however, also found that around 1 in 5 people in Ireland don’t drink. The same report shows that one in four deaths of young men aged 15-39 in Ireland is due to alcohol. A 2017 study found that 60.4 per cent of Irish women consume alcohol at some point while pregnant. Ireland has one of the world’s highest rates of Fetal Alcohol Spectrum Disorder (FASD), with an estimated 4.75 per cent of children being affected. Only South Africa (11.1 per cent) and Croatia (5.3 per cent) outrank it. FASD is a group of conditions that can occur in a person whose mother drank alcohol during pregnancy. Another report carried out by the University of St Andrews on behalf of the European branch of the World Health Organisation, published in 2018, looked at the alcohol consumption of teenagers across 36 countries and found that the sub-region of Ireland/Great Britain showed the largest decrease. In terms of regular drinking by 15-year-olds, Irish girls were second-lowest in the study with just 3% drinking on a weekly basis. In 2002, Ireland/Great Britain reported the highest levels of weekly drinking among boys (42%) and it is now the second lowest. Take a look at more Alcohol Facts in the country in the Alcohol Ireland website. Also, if you are a student, remember even light drinking can have adverse effects on your brain. Today, use #AlcoholScreeningDay to post on social media. You don’t have to hit rock bottom before you rethink your drinking habits. If you or someone you know is struggling, help is available. Take an Alcohol Screening, here. It could save a life.